A diptych of 9×12″ wc on coldpress. I LOVE forsythia, I grew up in a house that had a huge hedge of them around a ditch behind it. They grew over it so it was like a secret tunnel for me to hide in. I HATE marigolds. I paint them a lot though. We always had these perfect rows of them growing around the yard. 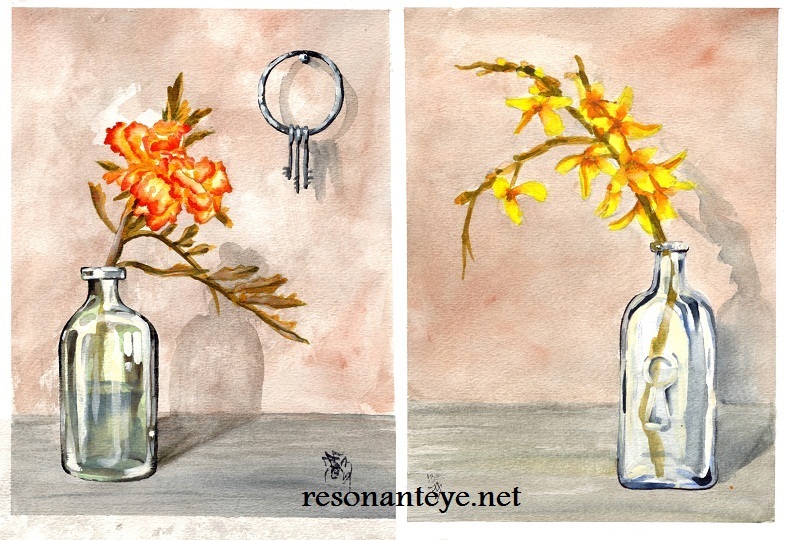 There are keys and a keyhole to tie these two paintings together. Along with a few of my antique glass jar collection as props. I love old jars, I wish I was brave enough to climb into old-timey toilet holes and dig them up. I think the stucco on the walls in these came out very nicely. The originals are still here, for sale. I plan to mat and frame them soon. I also have prints I’ve made on vellum-textured bristol, which I think came out nicely.